Given that I deal with words all day, and have been a publisher, in both electronic and print formats, for much of my mundane professional life, it's perhaps surprising that it took me so long to think about combining these skills with some of my SCA interests. It wasn't until Alys de Wilton was to be elevated to the Order of the Laurel that I thought about putting an item we had worked on together into printed broadsheet form (Dickon's Lament). Up to that point, I'd made lots of things like feast menus and certificates, but this was my first foray into producing something that could have come off a printing press in period. And that was so much fun, I kept finding other excuses to produce printed materials. One of the things which has really inspired me was the discovery of a great period-style font developed by Geoffrey Shipbrook (Jeff Lee). He based his JSL Ancient font on the font used in A compendious view of the late tumults & troubles in this kingdom by way of annals for seven years, by James Wright, printed by Edward Jones, 1685; and Ars Pictoria, or an Academy treating of Drawing, Painting, Limning and Etching, by Alexander Browne, printed by J. Redmayne, 1668. While these are outside the official SCA period, the fonts are very close to period printed examples. Even better, he has a great downloadable converter which lets you paste text in to convert it into the appropriate ligatures in his JSL Ancient and JSL Blackletter fonts. I've got an old book press which has proven handy in producing book covers and small bound books. The next steps are to produce some woodcuts to go with the printed material, possibly via linocut; to experiment with real ink, instead of laser printer; to learn more about period bindings. There are more printed material examples and discussions in my section on maps, as I'm using many of the techniques and tools across both areas. I wrote this for an A&S class as a general introduction to the style of period printing and how to reproduce the look of late-period printing for use in the SCA context. If you'd like something you can print out for study or distribution, here's a PDF version. There are many and varied claims for the invention of printing. China gets the nod, as with so many things, for the oldest printed book, the Diamond Sutra of the fifth century, made up of woodblock pages. However, as with so many of those inventions, there seems to have been relatively little knowledge transfer outside the borders of the empire. This handout deals with printing in Europe from the 1400s onwards. Block printing was well established in Europe in the 13th century, primarily for decorating cloth. It wasn't a big jump to printing on paper, once that became readily available in the 1400s and soon everything from religious images to playing cards were being produced. Carving lettering and illustrations into woodblocks was not very efficient, and the blocks didn't last too long either. When Gutenberg and others started experimenting with movable type, that caught on because of the uniformity it made possible, and the flexibility and robust nature of the technology. The uptake of the technology was very very rapid and spread very quickly throughout most of Europe. Thanks to Gutenberg, from 1439 the Germans had the early lead, but by 1500, Venice boasted over 400 printers and had become a recognised powerhouse for elegant humanist printing which still commands attention and admiration. Aldus Manutius and Nicolas Jenson produced beautiful works in very high quality typefaces, and found a ready market in small format books and softbound covers. Printers in Paris, which eventually become a major centre, started up in 1470. Even the New World had a press operational in Mexico City by 1540, and the Spanish were printing in the Philippines in 1593. Gutenberg had been very nervous that his new approach would not find favour with the Powers That Be. So he did his very best to try to make his printed Bibles indistinguishable from the traditional manuscript ones of the day. He initially had large capital letters filled in by hand, but quickly developed the concept of two-colour printing. Pre-1500 works by Gutenberg and others are referred to as incunabula, as they formed the "cradle" of printing. By 1500, it is estimated that 1,700 printers, operating in 300 towns, had produced around 15 million volumes. Print houses saw a combination of artisan skills and enthusiastic marketing. Master printers were assisted by apprentices. If the latter learned Latin, they might aspire to become compositors, setting the type; or become journeymen -- literally spreading the knowledge as they moved from publishing house to publishing house across Europe. It was strenuous work, involving preparing the new oil-based inks, dampening paper, working the hefty presses (themselves said to be adapted from olive oil presses). Specialisation came early, with the printers working in tandem with booksellers, who always had their eye out for a successful pitch. Caxton's first print job in England was the Indulgence of 1476, which had gaps for the names of the purchasers to be written in. Like Gutenberg�s Bible, it was designed to look as if it has been written in blackletter. Latin grammars and instructional books were popular, and many books had lengthy prefaces extolling the virtues of a noble (sometimes unwitting) patron. Caxton has the credit for the first printed book in England, his own translation of a history of Troy; he also printed Chaucer�s Canterbury Tales. Woodcut blocks developed from fairly crude efforts into fine form, and engraving and etching allowed masters like Albrecht Durer to produce astonishingly detailed illustrations to accompany the poetry, prose and all manner of secular text that started to pour off the presses. Design aspects in use today developed early: page numbering, title pages, tabbed entries and indexes, pointy-hand or leafy dingbats. What didn�t change was the technology, not for another 300 years. See the rest of this printing section for examples and further references. Format: Sizes vary (period examples: 312 x 200mm, 207 x 140mm). Usually paper, with vellum commonly used as a cover, tied with silk ties; sometimes covered in a leather wallet binding, closed with a strap and buckle. Single-page woodcuts of music were printed from the latter part of the 1400s. Moveable type used multiple pulls off the press to first print the staves, then the notes and lastly the lyrics. By the 1520s, individual type had a note, or other musical symbol, along with its section of stave, to allow compositing and single-impression printing. Format: song books were printed in separate parts, or with four different parts laid out at 90 degrees for the singers to stand around. Church music sometimes had double-impression printing to print the staves in red and the rest in black. Lines often start with large plain caps or initial woodcuts. Period playbills were too ephemeral to survive. It seems reasonable to base them on title pages, as these often referenced theatrical performances, including woodcuts from scenes; lists of characters and players; even song lyrics. 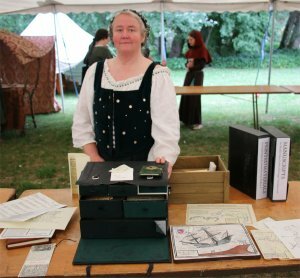 Much of what we print for SCA events would be regarded as ephemera � short-term forms of communication which are not designed to stand the test of time. This creates some interesting problems in researching period usage of such materials as they, too, tend to have been thrown away or recycled once their initial utility had passed. Many examples have only been found because of they have been recycled as pasted endpapers in books or somesuch. Consider the kind of document you want to produce � an event announcement, a playbill, a Ball cheatsheet. See if you can find examples, and get a feel for the impression they give in terms of layout and design. What kind of font/typography is used? Is it blackletter � sometimes thought of as German or Gothic, but used across much of Europe for printed materials from the late 1400s on. Or does the period example use a basic Roman font? Is there use of mixed font sizes, or the inclusion of italic lettering? Are there large initial capital letters at the beginning of the paragraphs, and what sort of style are these? While blackletter is the more common in period materials, for SCA use, it is probably better to go with a Roman font as many people have problems reading the more complex letter forms, especially in candlelight! There�s good reason why period printers quickly developed Roman typefaces or even imitations of humanist handwriting! There are lots of free fonts available. I highly recommend Geoffrey Shipbrook�s font set as a great late-period printing typeface. Pia Frauss has excellent fonts for a more handwritten look. Early printing in italic text often used non-italic capitals. It took a while for the idea of matched typefaces � and even capitals � to catch on. What orientation is the page? Is it landscape (horizontal) or portrait (vertical)? You need to bear this in mind if you are wanting to do a multi-page print on one leaf. Folding an A3 page in half will give you two leaves or four pages of A4 area to play with; use an A4 page and you have a smaller, more portable work. A single fold like this is a folio fold and is usually the largest size produced (typically over 13 inches tall in period). Make two folds, and you have a quarto (4to), with four leaves and 8 pages; fold again and you have an octavo (8to) of 8 leaves; 16 pages. Some of the folds will be on the edges, requiring cutting. Start with a big enough sheet and you can have a 64to as with some period printed miniatures. For our purposes an octavo from A4 is about as small as you�ll probably want to go. You can also change the familiar look and feel of modern page sizes simply by going for a different aspect ratio (the height to width proportions) � trim the page to make it narrower or, if you�re doing playbills or menus, lay out three copies across an A4 landscape page. What characterises the layout of the content? Are titles centred; does the lettering reduce in size; is the text right justified (ie does it line up on the right margin); how wide are the margins; are there notes in the margin (termed a scholar�s column)? Early printers played about with their typefaces, mixing them up and often going for a reduction in size as your eye moves down the major title. They sometimes liked to arrange the text to fit shapes, such as reverse triangles or even outlines of things like goblets. In period printed books, typically you�ll see large margins at the outside and bottom edge of the page; narrower margins towards the spine and often jammed tight up against the top. It can take a while to get used to this, as the modern eye is more familiar with a more symmetrical layout. The gutters (the internal white space between columns of text) tend to be narrower than we are used to, even filled with woodcut foliage. What characterises the graphic material? Are illustrations used; how are they placed within the page; do they have frames around them? A reasonable amount of copyright-free woodcuts are on the Web (see resources below). They range from the very rough to the exquisite. It�s a good idea to match the quality of the font you use to the illustrations. What is the paper like? What are the edges like? Choosing a suitable paper makes a difference; keep away from the bright white bleached modern copy paper if you can. There are cheap papers available which are off-white and comparable to period paper; you don�t have to print on vellum! A laid finish can be useful to give the look of a handmade paper � they can be identified by the parallel lines running against the grain of the paper, used to simulate the handmade output (or, easier, check the label of the ream). Some people like the feathery deckle edging as a Ye Olde Worlde effect; but early bookbinders and printers tended to trim the edges of their pages cleanly. The same holds for fake foxing or the tea-stain-type antiquing beloved of things such as maps to pirate treasure. The latter is traditionally done by splashing tea across a page, or the use of printed marbled paper � it�s really not necessary, as period paper was better quality than ours and has tended to stand up to the test of time. Main things to remember: You can go a long way to making something look more period with a suitable font, a couple of woodcut-style images and some non-bleached paper stock. Some period fonts would be perfectly acceptable today, and common everyday fonts like Times Roman, Caslon, Bembo, Granjon and others closely resemble what was used 400 years ago, even though they look very modern to our eyes. To avoid that issue and get the Ye Olde look, it helps to have a slightly more �distressed� font to work with. Pia Frauss fonts: lovely freely downloadable fonts based directly on analysis of period manuscripts (rather than printing) such as 1275 Hapsburg, Italian 1490, Danish 1597, using exemplars ranging from a Borgia, Tycho Brahe, Gaston�s Book of the Hunt and German chancery materials. Great for personal handwriting projects such as correspondence, journals, licenses, patents, without the need to learn the script. There are lots of possible sources, online or in the various Dover collections, ranging from exquisite to very crudely produced. You can also approximate with scanned hand-drawn material. Stay away from the pseudo-textured marbled papers beloved of scrapbookers and Ye Olde pirate party invitations. Period paper was surprisingly close to modern paper in both weight and look. The main thing is to find an off-white stock, it doesn�t have to be distinctly cream/yellow, just not the usual bleached white of modern laser/copier paper. I spent a year or so as a proofreader for an English-language newspaper in Japan, and was taught the rather arcane shorthand symbols used by Associated Press to indicate things like missing text and punctuation, lack of capitalization, bolding and the like. These symbols have changed only marginally since the very early days of printing, and Aldus Manutius and his brethren would have little difficulty in figuring out what was required from the marks in margins I have proofed (apart from the Japanese katakana iki replacing the still-used Latin term stet, for �let it stay as-is�). Hellinga notes one early work of 317 printed pages includes 46 pages �with marks which anyone who has ever corrected proofs will recognised as proof corrections�; she mentions her �shock of recognition� and goes on to note that �some pages have as many as 30� (pg 104). Clearly a work which needed scrutiny. So when I came to undertake the rather large project of Lady Elizabeth Braythwayte�s Book of Physick, I found myself printing a proof copy of the numerous signatures that made up the tome and working my way through proofing them for all the usual errors. I made a point of marking up the proofs in ink as I decided early on that I would have the proof copy bound as an example of my work and also an interesting teaching tool demonstrating the process of printing. In Antwerp I had visited the printing house of Plantius-Moretus (now a brilliant printing museum), where the proofreaders had a set of comfortable bench seats, a large table and big windows to aid them in their task of poring over the masses of printed material that came from that venerable family. The firm employed three proofreaders alongside 20 typesetters and 32 printers working with 16 printing presses. It is clear from marks in various incunabula dating back as early as 1459 (Hellinga, pg 111) that proofing was something undertaken regularly and eventually regularised into a set series of symbols with associated instructions. It is not surprising that relatively little remains of early proofing materials as the proofed copies were unlikely to be kept � even if proofed work was bound, proofing is typically done in the margins of the printed sheets, making such marks liable to be trimmed off when the publication is ploughed to straighten the edges of the signatures. That said, there are extant printers� copies with proofing marks from the 16th century across a range of printers working in Latin, Greek, German, Italian, French, Dutch and English, and some proof sheets have turned up within bindings or have been used for wrapping (as in the Plantius-Moretus house where type from the 16th century has been kept together with old proof sheets) (Hellinga). The first actual proofing manual was published just out of period in 1608, being the Orthotypographia of Hieronymus Hornschuch. Earlier work had been a bit a hit-and-miss, with early authors expected to turn up at the publishers and correct their own texts � a contract cited by Britannica and dated as early as 1499 makes the author responsible for such corrections. This did tend to encourage a highly individualised approach and lead to many dark comments about the lack of literacy amongst typesetters and others involved in the process. Lawsuits ensued from the 15th century onwards, and errata sheets soon made an appearance to try to correct the more egregious errors. It had clearly become an issue as in 1539, Francis I approved regulations requiring printers to �employ capable correctors...to correct the books with care and diligence� (McMurtrie, pg 12-13). In return, authors were exhorted to provide decent copy for the typesetters to work from, as scribbled text with complex corrections were considered as much a part of the problem as hasty typesetting or jobbing print firms. Hornschuch produced his manual with the aim of regularising production and eliminating errors, making books more useable (Cormack & Mazzio). Like many early proofreaders, he had an academic background, being a doctor of medicine, and familiar with a number of languages. Interestingly, although proofreaders were well established by then, the actual term �proofreading� only dates back to the 1930s (Lee). There was a medical topic in the Kingdom A&S selection for November Crown AS50, so I thought I'd take a closer look at the Hippocratic Oath which I'd prepared for Lady Elizabeth Braythwayte's Book of Physick. The Hippocratic Oath is well-known as the oath traditionally taken by physicians, covering a number of ethical standards of practice and care. The Father of Medicine, Hippocrates, is credited with writing the oath in the fifth century BC; various translations and modernisations have seen it continue to be used to this day often as an acknowledgement of a physician taking up formal practice post-training. The writings of Hippocrates and Galen formed the basis for medieval medical training from the 11th century onwards as more of these texts became available through translation via the Arabic world. Prior to that, the Oath had been discussed by church fathers as a contrast to the ethics of Christian provision of "medicine of the soul" (Veatch). Although clearly of Greek, and therefore, pagan, origin, Byzantine scholars modified it in the 10th-12th centuries to fit "in so far as a Christian may swear it". This included obviously changing religious references but it also led to the removal of a number of sections relating to surgery, abortion and the sanctity of the oath as a form of initiation ceremony (Wallis, pg 429; Veatch). A physical approach to that Christian adaptation involved forming the oath into the shape of a cross to reinforce the change in cultural context. At least two early Byzantine manuscripts survive which show this: the Urbinas (10-11th C) and the Ambrosianus (14th C) (Jones). By the end of the 15th century, the Oath was circulating in Latin, translated by Italian humanists such as Niccolo Perotti (1483) and Andreas Brent (1490), and cited at the University of Wittenberg in 1508. The complete Corpus of Hippocrates in Latin was printed in 1525 by Calvus (Edward Worth Library), and in the original Greek in Venice by Aldus, in 1526 (Glick). English versions of the Oath started to circulate in the second half of the 1500s, with the earliest from 1566 in John Securis' A Deterion and Querimonie of the Daly Enormities and Abuses Committed in Physick (Larkey). I wanted to include the Oath in a collection of medical works I was researching for a bespoke book project, and wanted it in English so that it could be easily read. The translation is from the Harvard Classics edition, retaining the original Greek oath. The cross layout is based on the 12th-century manuscripts, most particularly the Byzantine Urbinus text, and follows the general form of printing and font as used by Aldus. (Combining the Greek text and the Christian cross is anachronistic, I know.) The title line of Iusiurandum Hippocratis (the Oath of Hippocrates) is taken from the index used in the Aldine Hippocrates of 1526, and laid out based on the title-page text of that edition, using a comparable Roman font and a shifted final period point. For Canterbury Faire AS49, I was asked to produce a proclamation pertaining to the Gypsy Market, warning people against attending such a disreputable gathering. I figured it would be relatively easy to find a suitable period model, as I was aware of the long history of prejudice against "Egipcyans". There were a number of such proclamations and various Acts containing such warning, along with exhortations to exile and various punishments. Dyverse outlandysshe rogues, vagabonds, and sturdy beggars, using no Crafte and with Questyonabbe Merchanndyce and Devlish and Naughtie practicces going from playce to place in greate companies, wandering in the Habite Forme of Attyre of counterfayte Egipcyans and used greate sybtyll ad crafty meanes to deceyve the People that they by Palmestre coulde telle Fortunes, and commyttyng ,amy and haynous Felonyes and Robberies to the greate Hurte and Deceyte of the People that they had comyn amonge, said rogues, vagabonds and sturdy begggaris sall not be suffred to come within this Realme ; and if they do, shall forefit to H. M. all their goods, and be commanded to avoid the realme within 15 days, on payne of improsonment, and every sheriff, Justice or escheator, may seize such goods to H.M.s use, and account thereof in exchequer, and have to his own use a moiety thereof. This act shall not extend to children not above 14. It followed along the lines of the 1530 Act concerning Egipcions and similar moves in 1535, 1549 and 1555. Wording in the 1549 act implies that those who had left the realm �had enterprised to come over again�; the 1555 one included punishments for �any one importing Gypsies� Tudor Travellers, from Pre-Elizabethan England. I was interested to find that Scotland had apparently passed similar laws, as numerous gypsy or traveller sources referenced an Act of Stringency passed in 1571 (see, for example, the Scottish Gypsies website). However, I couldn�t find any actual record of such an Act in the records of the Scottish Parliament. Dyverse outlandysshe rogues, vagabonds, and sturdy beggars, using no Crafte and with Questyonabbe Merchanndyce and Devlish and Naughtie practicces going from playce to place in greate companies, wandering in the Habite Forme of Attyre of counterfayte Egipcyans and used greate sybtyll ad crafty meanes to deceyve the People that they by Palmestre coulde telle Fortunes, and commyttyng many and haynous Felonyes and Robberies to the greate Hurte and Deceyte of the People that they had comyn amonge, said rogues, vagabonds and sturdy begggaris sall not be suffred to gather in publick places nor peddel their wares and dubyous trades to subjeckts of this Realme / moste especially not behinde the arming pavillions during the revel of a Monday e�en / on Payne of Improsonment, Forfeiture of Goods and Banishment of the Realme. It was laid out as per standard posted late-period proclamations with a large initial capital and ending with God save the King. We posted a copy on the Market Cross and I think it was read aloud to close the Gypsy Market. 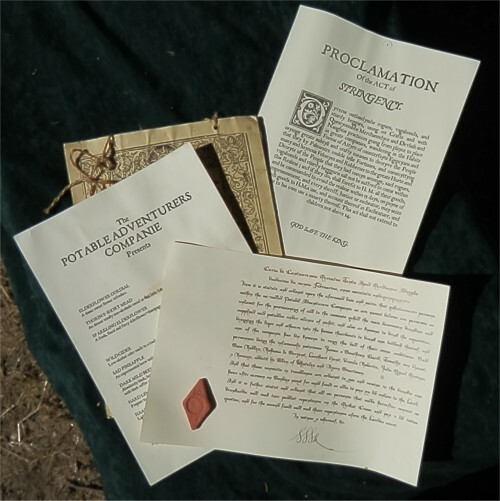 Some examples of various printed items made for Canterbury Faire AS49, including the listing of the Potable Adventurers' offerings, their "wanted poster", and the Proclamation of the Act of Stringency. 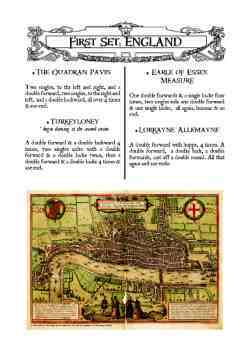 For Canterbury Faire 42 I was asked by Mistress Katherina Weyssin if I would do a ball handbook in a late-period printed style, with instructions and maps and suhlike. How could I refuse? The 12-page handbook was graced with a picture of Caroso on the cover. In honour of the theme of the an Age of Explorers and Sea-Farers. I used the Windlass font in addition to the usual JSL ones, as it has a distinctly bucanneer/piratical feel to it. 1. It is unseemly to always dance with the same person, therfore be courteous enough to invite strangers, travellers, those shy of nature or less sure of the steps to dance. 2. Lords may ask ladies to dance; ladies may ask lords. Lords may ask lords to dance; ladies may ask ladies. Venture forth and ask, so that all may enjoy themselves. 3. If attending a ball, you are clearly near enough in rank to any other that you may approach and ask them to dance, whether a King, a Duchess, a Baroness or a Knight. It's always nice to try and encourage better mixing, even if it is usually in vain! I have printed playbills for the Half-Circle Theatre at Canterbury Faire, and for Master Steffan Glaube's Mandragola play at Rownay Festival. Here are the PDFs, sized for three to an A4 sheet to get the right kind of proportions. I've been intrigued by the Elizabethan roundels, thin wooden (sometimes just varnished paper) placemats. The examples I've seen have poems or verses with an illustration. They were typically handed out in box sets, very much like the cork placemats elderly aunts today invariably give as wedding gifts. I like the idea of producing a set for personal use, as well as possibly producing a set for a feast, with the menu on one side and songs on the other. I'm still in the experimental stage with these, looking for suitable artwork or artwork styles. I think they'd be very handy as an encouragement to singing for the hundreds of songs we know the chorus to but can only stumble through the verses. 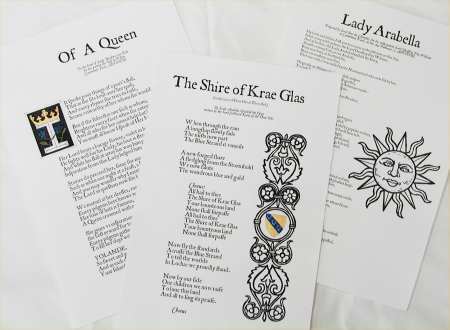 (The example shown here has the verses for Greensleeves. I wanted to produce something that could act as a souvenir for Canterbury Faire and be interesting at the same time. Long years as an astronomy writer, and as a sometime astrological chartmaker, suggested a possible tack, and thus the Almanac was born. The research was a great deal of fun, in deciding what manner of predictions to include, how to modify the horoscope casting for period use and so forth. The most awkward thing was that I didn't have any extensive period facsimiles to work from, just the odd page referenced here and there. I'll have to see what I can find for any future edition to produce something more closely resembling what was printed in the late 1500s. Telling the time and predicting the future have always been important aspects of civilisation. Roger Bacon (Opus Majus, 1267) was the first to use the Arabic-derived term Almanac to describe his set of tables of the apparent motions of the heavenly bodies. Early almanacs also used the term prognostications, supplementing astronomical and calendrical information with discussions of the influence of the heavenly bodies on earthly topics such as weather, health, romance, and national and international relations. This 16th-century almanac starts with the Common Notes, being a list of obscure terms and data used typically to calculate moveable feasts, such as Easter. The dominical letter of the Gregorian calendar year is the letter label of the Sundays in the year; leap years receive two dominical letters. The golden number is a 19-year cycle related to the Metonic lunar cycle, and called such because it was written in gold in early church calendars. It is used in computing the epact, which relates the lunar and solar calendar. The Constantine indication is a 15-year cycle introduced by Constantine for tax reasons which, according to Madore, is "part of the computus but of no interest whatsoever except to decorate calendars". And The Answer is, of course, the Answer to Life, the Universe and Everything - there's got to be an anachronism in everything to avoid perfection and the potential for hubris, after all. Almanacs traditionally had a section for the "Zodiac Man", which depicted the parts of the body which corresponded to astrological influences, providing medical and romantic advice (Lawrence, 1898). The text used in this section has been adapted from an almanac in use in 1571, with some material from William Lilly's Christian Astrology (1647) and William Ramesey's Astrologia Restaurata (1653). ...many almanacs proved they were not too exalted for dull or uninspiring doggerel verse, even if the poetry appertained to medical advice. Likewise, some almanacs demonstrated sensationalism was not beneath their authors. Far-fetched prophesies, baseless political speculation and acidic social commentary could be found even in the most profitable publications. This sort of information has, of course, been included in this version, with prognostications covering the weather, general predictions and astrological aspects. The weather predictions are based on the NZ MetService summary for early February in Canterbury, with a suitably uninformative approach comparable to many found in almanacs throughout the 1500-1800s (or in modern forecasts for that matter!). The general predictions are based on the 1591 satirical almanac A Wonderfull Astrologicall Prognostication, in ridicule of the almanac-makers, allegedly penned by Adam Fouleweather, and commonly attributed to Thomas Nashe. Also included are a couple from Rabelais's Pantagruelian Prognostications (Chapter 25 of the Third Book of Pantagruel; 1532) and a line from Merlinus Anonymous. The astrological aspects come from an event horoscope drawn up for the time of Canterbury Faire's opening court, using the interpretations provided by the Astrolabe astrological service, as well as relevant material from Lilly and Ramesey relating to the planets, signs and placements. Almanacs also listed information about saints, often deliberately including fake ones and some decidedly unsaintly listings or datings. This almanac's saints (all real) were selected from the list maintained by the Catholic Forum; the datings (not all real) were developed based on those contained within period almanacs. I wrote the closing poem based on the famous opening lines from Chaucer's Canterbury Tales. Almanacs were extremely popular works, and consequently were early to print; the first printed almanac known was by Purbach (compiled 1450-1461); the first English almanac is dated 1500, printed by William Parron, who was attached to Henry VII's court. The general approach is known to have stayed static for almost 200 years, so I have assumed it reasonable to use some post-period examples in deciding on the text and layout. Almanacs were often produced as small booklets for ease of carrying and reference. The typeface used is JSL Ancient, developed by Jeff Lee based on the transitional typefaces used by English printers Edward Jones and J. Redmayne in the late 1600s; the text has been run through Lees' JSL Font Converter to produce ligatures. The cover image is adapted from the Prognostication printed in Lyon for Michel Nostradamus in 1555. Here is the text ot the almanac. Lat. 43 Deg. 33 Min. South. No part of man's body ought to be touched with the Chirurgicall instruments, or cauterie actuall or potencial, when the Sunne or Moone, or the Lord of the Ascendent, is in the same signe that ruleth that part of man's body. At this time look for the Kings Evil, sore Throats, Wens, Fluxes of Rheumes falling into the Throat, Quinzies. And with the Moone in Cancer, check for Whelks, Pimples in the Face, small Pocks, hare Lips, Polypus, (noli me tangere) Ring-worms, Falling-sicknesse, Apoplexies, Megrims, Tooth-ach, Head-ach and Baldnesse. If the same be for the Pestilence, the Phrensie, the Pluresie, the Squincie, or for a Continuall headach, proceeding of choler or bloud; or for any burning Ague, or extreme paine of partes, a man may not so carefully stay for a chosen day by the Almanack: for that in the meane tyme the pacient perhaps may dye. For which cause let the skilfull Chirurgeon open a veine, unless he finde the pacient verie weake, or that the Moone be in the Same Syne that governeth that part of man's body. Seekest thou a Chirugeon for your ills, a water-bearer for your thirst. The windes will be NE or SW, or S and NW. It will be hotte when not colde. The blind will not see much, the deaf will hear rather poorly, mutes will not talk much. Court opens when the rising sign is in Aries, a Masculine, Diurnall Sign, moveable, Cardinall, Equinoctiall; in nature fiery, hot and dry, cholerick, bestial, luxurious, intemperate and violent. The Sunne in Aquarius brings new ideas, and the Moon in Cancer, its onely house, is Watry, Moyst, Flegmatick, Feminine, Nocturnal. The windes will be SW or S and colde, or NE and NW and hotte. Manye shall goe soberer into Tavernes than they shall come out. The rich will be a little better off than the poor, and the healthy will stay better than the sick. For all these times herein this place, the stars say that you and your peers aspire to change your society with new goals, but these must be grounded on this Earthe in order to be accepted by the peoples. Venus is in Pisces so beware lest your privvy fantasies appeal more than things of the earthe, and be certes that those you assist are worthy of your devotion. In this signe is one prone to Venery, delighting in Baths, and all honest merry meetings, a Company-keeper. When he took the cowl at 20, Amand's family were incensed and attempted a kidnap. Committed to a life as a mendicant preacher, Armand was assaulted by the ungodly in France, Flanders, Carinthia, Gascony and Germany, where his wanderings in beer and wine-making provinces saw him associate with brewers and vintners to his harm. He passed to heaven in Elnone in 679. Patron of brewers, innkeepers, wine merchants, vintners. The windes will be hotte when NW, windy when NE, colde when SW or S. Of wheats, wines, fruits, and vegetables never have this many been seen, if the wishes of poor folk are heard. Mercury in Capricorn shows the need for much planning and direction, with earthiness of humour. Saturn in the sign of the Crabbe says that self-control will rule your days. The north node in Taurus shows that you wish the company of your peers, but let not mere self-service be your motivation. 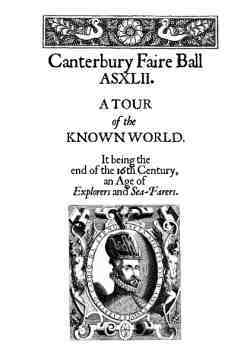 As for Travell, and whether such a Country, City or Kingdom will be healthfull or prosperous unto you, know that Venus in the Ascendant means you may safely travell or sojourn hereunto the place of Canterbury Fayre. A draper's assistant, born of Catholic parents in Protestant England, Thomas was condemned to the Tower of London for his faith, and tortured to obtain the place from whence he had attended Mass, and while therein he ministered to other prisoners. He averred that Queen Elizabeth was excommunicate and denied her supremacy over the Church. He was martyred 7 February 1578 by dragging, hanging, drawing, beheading and quartering. The windes will be windy when from the NW, NE and SW, and strong when in the S. Butter shall melt with the extreme heat of Summer; and those that are hanged shall never live to be drowned. Possessions have great import with Mars is in Taurus; jalousie may be raised between lord and lady. Look for one who is big in Face; large, strong Shoulders; great mouth, and thick Lips; grosse Hands; black rugged Hair. Jupiter in Virgo marks the sign of the Pelican, with dutie and responsibility justly rewarded. In shape and forme is found a small shrill voyce, all members inclining to brevity; a witty discreet soul, judicious and excellently well spoken, studious and given to History, whether Man or Woman. This sister of Saint Congar lived a life of quiet sanctity and private vows. Once when she visited her brother in his hermit's cell he refused to see her, fearing that even the sight of his sister would prove a distraction. To prove her holiness, she summoned a wild boar, and miraculously caused him to obey her like a pet. He accepted it as a sign. To make new friendships and greete with joie familiar faces. Having finally sussed how to save PDFs out of Ventura, here is the full typeset version of the almanc as a PDF. It's laid out to be printed octavo on A4, double-sided. You can read about the song itself and its background here. This section deals with the actual production side of the song as a broadsheet. Printed music, in the form of single-page woodcuts, came into being in the latter part of the 1400s. The development of movable type made it viable. By the 1520s, music fonts were created with each piece of type having a note, or other musical symbol, along with a section of the stave (Gaskell, 1972: 138-39). Close examination of such music (eg Ravenscroft's Pammelia, 1609; the Sibley Music Library collection) shows this approach in use. The reversal of the beams ("tails") of the notes also suggests that, in order to save on the number of different slugs required, printers simply inverted notes to double their usage. The compositer used so-called "vertical" type, in which single notes founded on complete sections of staff are compiled together with other blank sections of the staff in various widths to form a single impression. In this example each piece of type does not always align neatly with its neighbor, resulting in a visually "jerky" flow of the musical line. This effect has been reproduced in Dickon's Lament by hand-drawing the note types, scanning them and then assembling them electronically as individual slugs. The general layout is comparable to that of Pammelia, without exactly reproducing Ravenscroft's format - the initial capital, for example, has been made somewhat larger, and without left justification; this was purely a design decision. The symbology within the capital has been selected for its references to the lament (bow and arrows; the Hermitage tower; Scots thistle and acorn), rather than simply reproducing a period capital. An extract from Ravenscroft's Pammelia printed in 1609. An extract from Dickon's Lament. If you'd like to print the full page, save this version. The music itself is in white mensural notation, a precursor to modern musical notation with some distinct differences, most obviously in the diamond-shaped heads of the notes. The "railway line" clef mark at the start of each line indicates the position of C. At the end of each line, the "tick" indicates the pitch of the note at the start of the next line; a convenient assistance for the sight reader. Except for the title, which is in Buccaneer (a Scriptorium font), the typeface for the lyrics is in JSL Ancient, as developed by Jeff Lee based on the transitional typefaces used by English printers Edward Jones and J. Redmayne in the latter part of the 1600s. While outside the SCA period, they are very close in style to the typeface used in Pammelia and in earlier print examples. The text has been run through Lees' JSL Font Convertor to produce the ligatures and special characters used at the time. The period spelling and Scots usage (eg quhar for where) has been based on original source material such as ballads and letters from the latter half of the 16th century. The paper is a high-rag content paper cut to 15" x 10" (375 x 250mm), the size which formed the typical standard folio sheet or broadside. Gregory Blount of Isenfir (Greg Lindahl) refers to this size with regard to a printed broadsheet reproduced by Holbein. It also makes a good presentation size for gift purposes on the occasion of Alys de Wilton's elevation to the Order of the Laurel. Drat! Dame Alys noticed the fact that the staff doesn't left-justify alongside the leading edge of the block capital. I've been looking for other examples of printed music in period which do what I have done. The nearest so far is an example from Playford, but that is 1680 or thereabouts. If you know of any, please, please tell me. The other error is an incorrect note in the final stave. I could redo the whole thing or accept it as an example of "the Matty Groves effect" (ie tunes and lyrics changing over time through errors of written and oral transmission). I've tried singing it the "new" way and it sounds acceptable, so I'll leave it for the moment. Perhaps I'll do that when I put it into modern notation, which I'd like to do, adding the bass drone part where my harp gets to imitate a bag-pipe (what a cruel and unusual punishment for such a nice instrument!). A rendition of the Patron's Bardic item, or other such ballad, poem or prose of their choosing to be fashioned at their command in the form of a printed Elizabethan broadsheet suitable for display. Here the version I did for the poem honouring the then-Queen of Lochac, Yolande Kesteven. The pseudo-woodcut capital I made incorporates borage flowers as a symbol, as well as the Crown. When I came to save this as a PDF, I had to take out the ligatures and long s character used in the original. This is the non-illuminated version.